Command spaces from B2C industry expos to corporate boardrooms with large-format, top-quality trade show exhibits printed by your partners at SpeedPro. As one of the nation’s leading full-service print studios, we can help set the scene for your next industry conference, trade show, traveling presentation and many more critical industry events. Business displays exude the personality and purpose behind your company, ensuring trade show attendees stop by your booth and linger there, informed, engaged and invigorated. 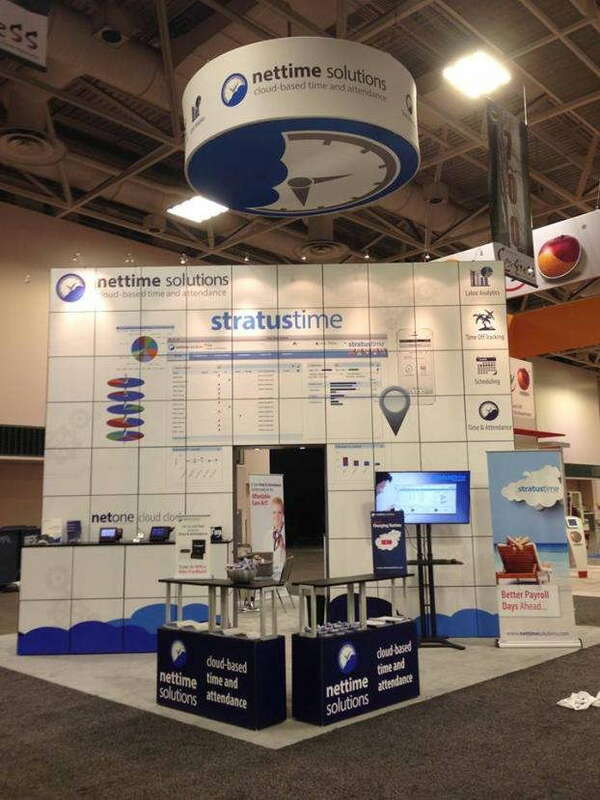 What Are Trade Show Displays? 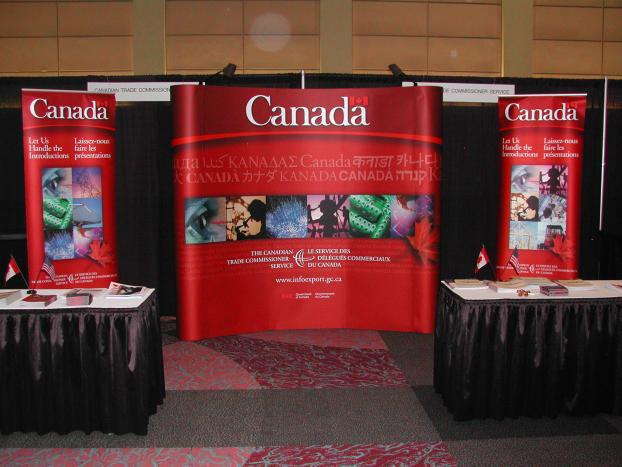 Trade show exhibits are the branded displays businesses set up at various professional or public events. They contain individual pieces and components that, once installed together, create a distinctly branded space a business occupies during specialty functions. Exhibit designs are highly branded. Each item that makes up the overall booth contains cohesive, on-brand design elements, from corporate color schemes and logos and to brand-compatible text, pictures and experiential perks. 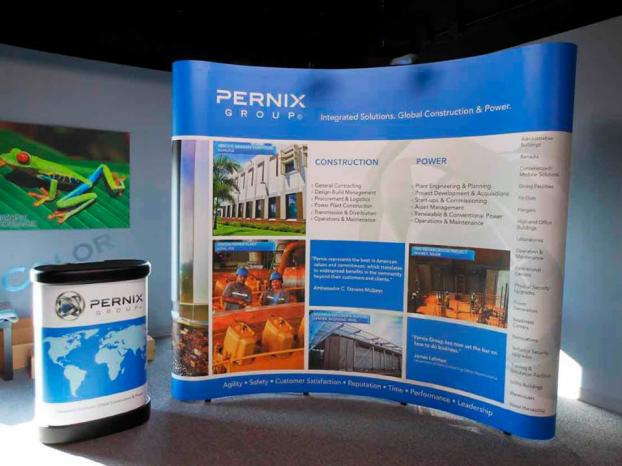 Portable trade show displays and systems make it easy for businesses to recycle exhibit displays, putting their best, most consistent professional foot forward no matter the time or place. 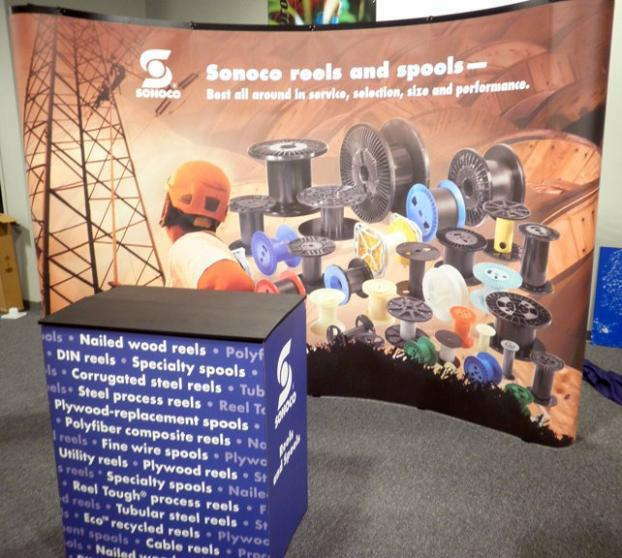 What Makes a Good Trade Show Display for Businesses? Table or surface graphics: These are the fabrics and print materials covering booth tables. 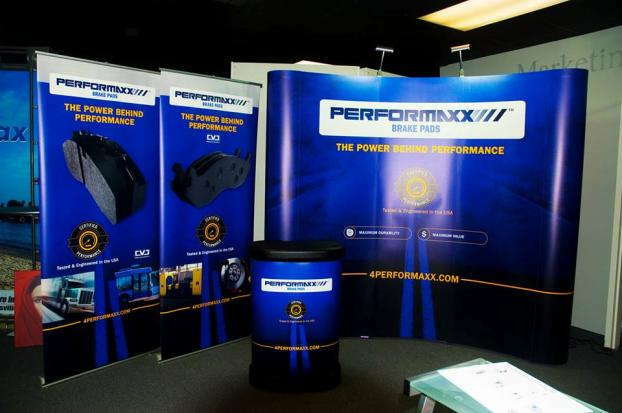 Table graphics include table skirts and draped table runners as well as tabletop display items like miniature pop-ups, literature racks, touchscreen mounts and tabletop signage systems. Floor graphics: These short-term stickers and decals with adhesives are made for specifically for floor applications. Floor graphics allow you to “peel and place” semi-permanent logos, pictures or messages right onto your booth’s floor, further branding your space. Booth backdrops: Use these large-format sheets and canopies as your exhibit’s main background material. Square or rectangle fabric backwalls start at 8 feet wide and are available up to 30 feet wide. Backdrops also include paneled backwall accents, half walls or hanging banners. Wall graphics: Install these graphics and signage onto nearby booth walls or partitions. 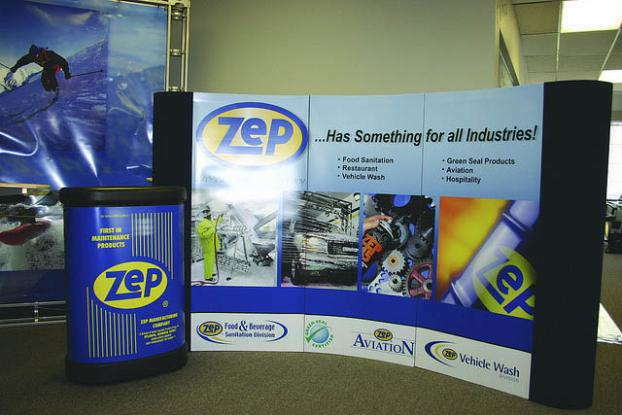 Wall graphics include wall-mounted banners, folding panel screens and fabric poster displays. Booth formations: This is the overall layout of your exhibit design, often designed into a kit. We offer classic table-booth kits, counter-style kits or 360-degree island-style kits. Each kit is portable, modular and easy to assemble. Additional installation features: Add extra features such as fabric overlayed walk-up counters, ceiling-hung structures and architectural fabric components to your trade show booths. You can also select from many modular accessories to add expressive touches to your final trade show displays. Interactive elements: Interactive installations and features give booth visitors a more immersive, hands-on experience. These include digital signage, step and repeat banners, kiosks, computers, televisions, touchscreens, fabric iPad stands and much more. 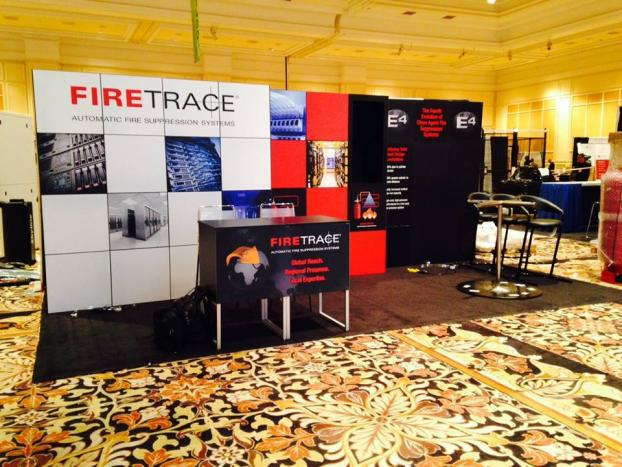 Why Use Trade Show Exhibits? There are many marketing, public relations and profit-building benefits to top-quality trade show displays. Impress the right people not just at the right time, but every time, with custom trade show materials built for business impact. 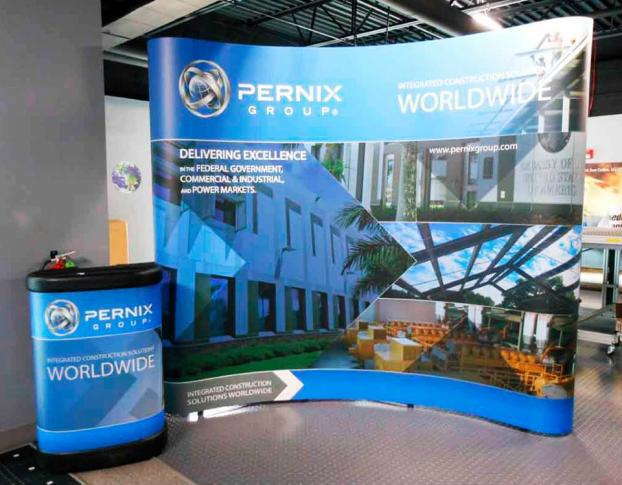 These displays are eye-catching and appealing, drawing attention to your company in a way that establishes a near-instantaneous positive reaction. Professionality: Branded displays give your business in greater prestige. They show you put in the time and the resources to design, print, transport and set up stand-out displays, which conveys something about your company’s quality and character. Personality: Trade show booths can contain humor, warmth, innovation, creativity, elegance, extravagance — you name it, booth designs and accessories will enhance it. Industry authority: Build greater trust and expertise just from showcasing consistent, high-quality booths in your signature brand style. Relevance: Attending trade shows and other industry events says a lot about that standing of your business. Maximize every moment you’re in the public’s eye to make meaningful connections and convey your company’s relevance. Portable trade show displays for business promote many of the same messages as your regular advertisements and marketing strategies. You can use and re-use them at B2B industry events as well as public-facing and direct consumer ones. Think branded event tents set up at festivals, parades, municipal celebrations, farmers markets, fundraisers and any other public gathering open to vendors. Everywhere your exhibits go, there are opportunities to nurture leads, increase qualified sales and generate positive vendor or client follow-up. Companies with engaging trade show displays curate greater brand awareness. That brand awareness can quickly be leveraged for a host of business benefits, from increased website traffic and higher sales volumes to a new partnership with an exclusive supplier. As these opportunities mount, so does your market share. Businesses with their eyes set on exerting more control over a product or service often do so by working their networks. What better place to meet and greet industry influencers, establish connections and generate greater brand awareness than at the heart of these events — the trade shows, conferences and expos that portable exhibits are built for? Companies outline regular business objectives to reach their next phase of growth accomplishments. Tiering these goals across weeks, months — even years — a company guides its growth by following the plan. Trade show displays complement many of today’s strongest business goals. 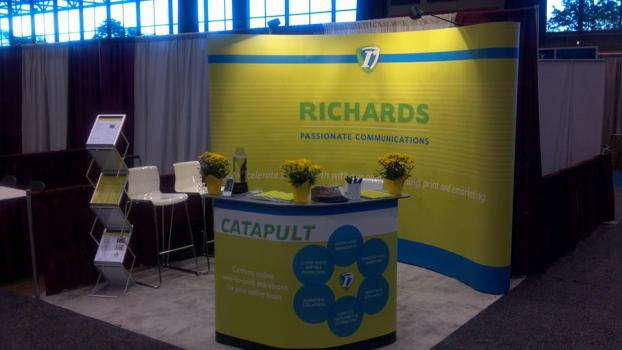 From increasing brand awareness among a target demographic or launching a fresh line of products to revamping the design of a company’s trademarked logo, trade show booths are branded collateral and therefore tied to any company-branded initiative. Corporate trade show displays give a face to these efforts, providing a real-life, real-time backdrop to amplify your company’s goals and growth. Pop-up trade show displays are one of the greatest assets companies have when interacting with public and private clients. They’re portable, reconfigurable, versatile and highly customizable. Visual communications studios like SpeedPro assist in designing the exact exhibit pertinent to your industry and branding needs, at price points equally appropriate. Once designed, you have a dynamic piece of experiential branding to use again and again. 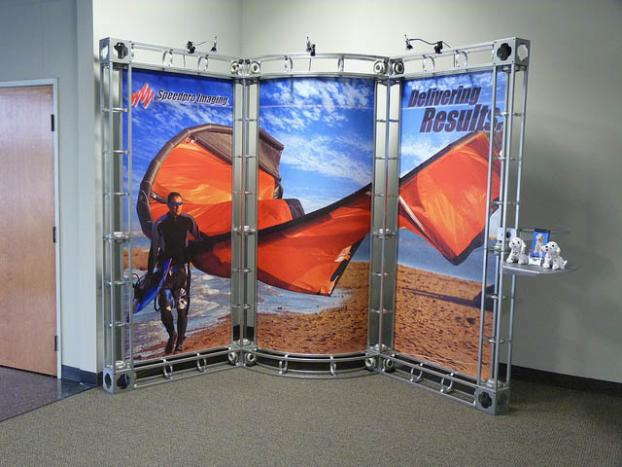 The right trade show display for your business depends on where you are going to use it. 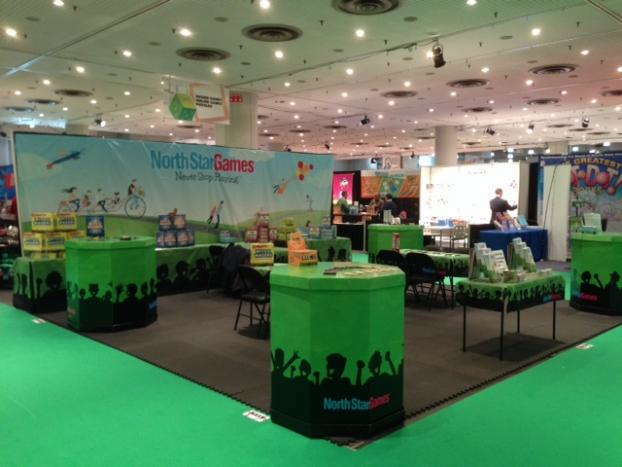 The many applications for exhibit booths and branded materials may surprise you. Pitches and presentations: In-house and external pitches alike benefit from the most professional, high-quality displays possible. 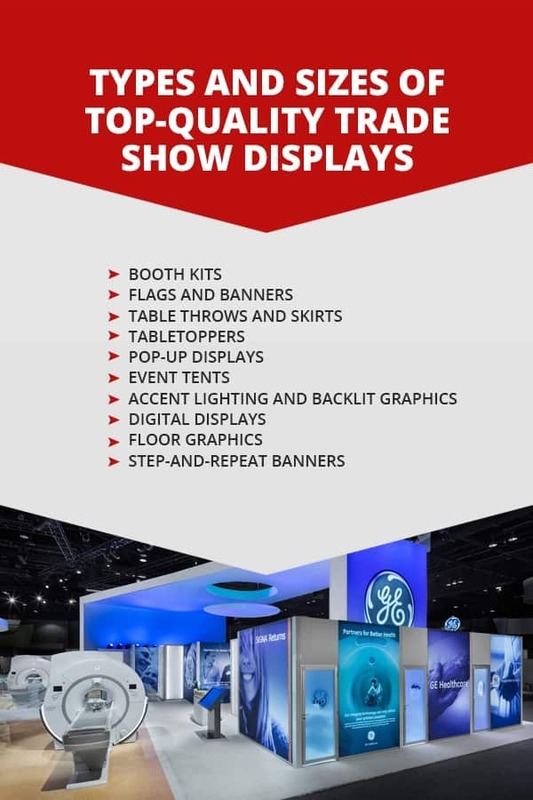 Collateral like folding panel displays, collapsable displays, info centers and reconfigurable sign systems can all be packed up and reused whenever an important pitching opportunity presents itself. Product launches: The excitement of new, developing or revamped merchandise deserves graphics to honor the moment. Many times, product launches are the first place public and private clients experience a new product. Use trade show booths and similar event graphics to make these events the celebratory, highly-branded occasions they should be. Conferences: Industry conferences make a natural fit for corporate trade show displays. Stand out from the sea of other booths and industry competition by designing your most immersive, out-of-the-box displays sure to draw attendees to you. Expos: Expos often allow the general public to meet, greet and interact with business representatives and their products or services in real life. 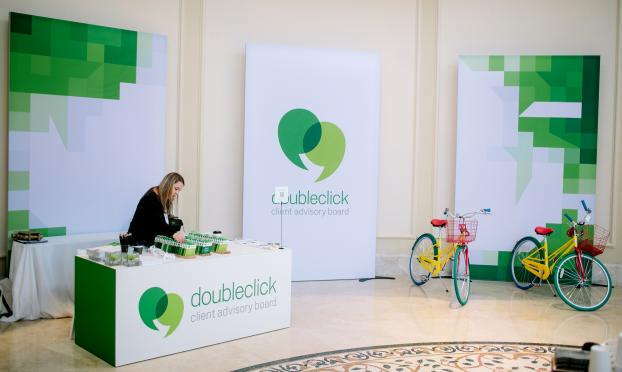 They’re ideal events to convey the professionalism, personality, relevance and overall industry authority and are fundamental to lasting consumer connections. Premieres: Like product launches, premieres are used to give digital and entertainment products a memorable jumpstart. Supercharge the energy at a premiere-like gathering using signature trade show displays and materials, particularly ones designed to highlight multi-media electronics. Community events: Fairs, farmers markets, city-wide holiday celebrations, public concerts and more bring together huge swaths of current and potential customers. Tents and indoor and outdoor pop-up displays can be fashioned for these community events, ensuring you make the right impression as you put your brand in the public’s eye. Fundraisers and charity work: Charitable events require many of the same printed graphics and aesthetic-enhancing media as private, industry ones. Whether you’re participating in or hosting your own charity function, SpeedPro consultants can help design flags, banners, tabletoppers, fabric structures and interactive displays fitting this special occasion. SpeedPro carries some of the large-format print industry’s most extensive trade show exhibit lines. See for yourself what we can design — and what you can display at your next professional undertaking. 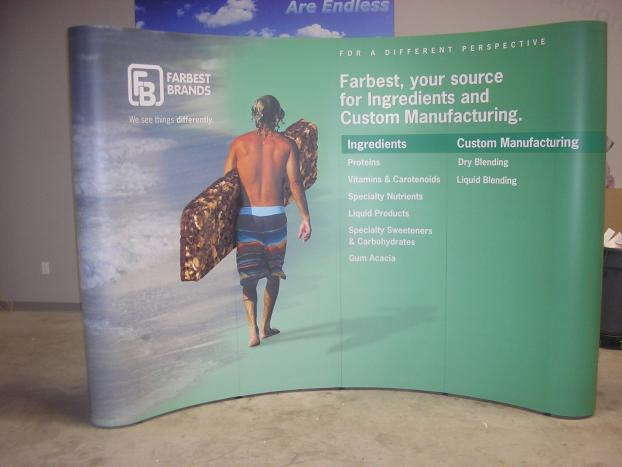 Linear module: Linear trade show displays have a rectangular fabric backdrop and a portable extrusion frame, available in 10-foot and 20-foot modules. They have the option for additional fabric pillowcase and wing fabric accents as well as display accessories. Vector frame modular: Vector frames are a geometric modular kit with push-fit SEG backdrop graphics and aluminum framing that, when assembled, give displays a unique staggered, 3D extrusion. They are available in 10-foot and 20-foot modules with optional LED graphic backlighting and matching counters. Hybrid modular: Hybrid kits combine the push-fit SEG backdrops and aluminum framing of vector frames with the fabric and accessory extension available on linear modules. Additional features include canvas canopies, half walls, LED lighting, geometric architectural fabric structures and electronic hook-ins. Island and orbital: Island kits and orbit trusses create circular, 360-degree trade show displays rather than linear, rectangular or square walk-ups. Fabric graphics and other accessories are held by strong steel trusses and can feature additional towers, canopies, kiosks, storage space or merchandise shelving. Island and orbital kits come in 10-by-10-foot and 20-by-20-foot configurations. Each flag or banner comes with a durable framing system. Aluminum and plastic piping frames remain the most popular, though exhibit designs going the extra mile can opt for choices like illuminated fabric frames or extra strong steel trusses. Each banner and frame type is portable and requires no special tools for assembly or disassembly. Table throws, runners and skirts are the fabric overlays draped over a regular trade show table or counter. They boost a plain surface’s appearance and enhance the aesthetics and messaging affordances of your booth. Choose from 11 base fabric colors and over 20 printed or imprinted graphics in customizable lengths and scales. Adorn your portable trade show exhibits with accessories transforming it from a 2D display to a 3D, interactive experience. SpeedPro carries portable literature racks, kiosks, counters, shelving, tablet stands, multimedia fixtures and more tabletoppers and booth enhancements. You can also select from a range of trade show signage lines to round out your display, from standing and snap-frames and directional signs. 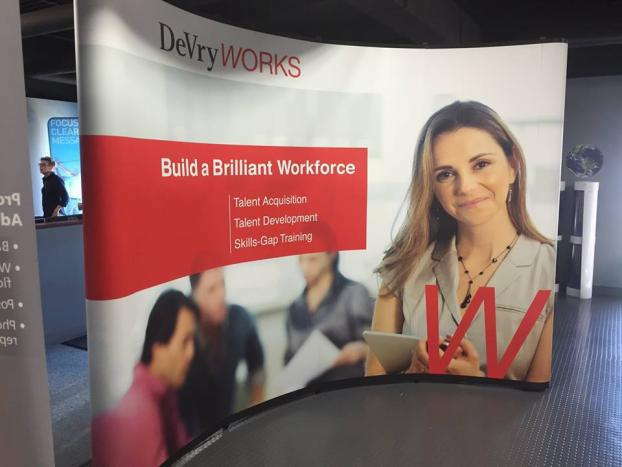 Collapsible displays: Collapsible displays come in four lightweight, quick-assembly varieties with accordion-style support frames, perfect for displaying branded imagery and text. Folding panel displays: Folding panel displays use printed panels you can fold up and take with you on the go. 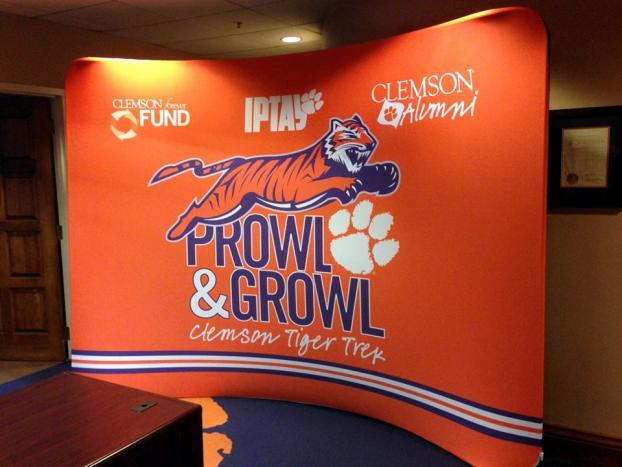 Sizes range from 48-inch by 24-inch tabletoppers to 5-foot by 5-foot standing backdrop panels. Customized event tents let you bring your booth outdoors. 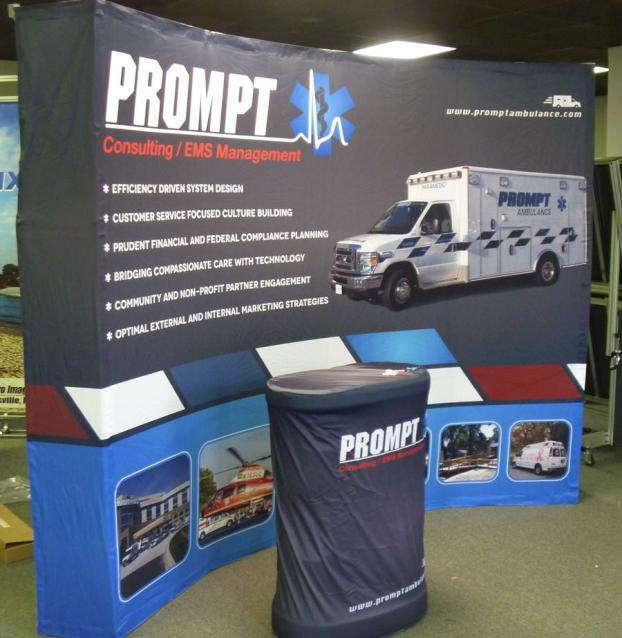 SpeedPro prints pop-up tent modules with customized tension fabric canvas or canopy tops, walls, half-walls and backdrops using only the best of today’s UV-resistant inks. Display lighting elevates your trade show exhibit to the next level, ensuring your booth is bigger and brighter — literally — than any other. Many businesses employ illuminated graphics to highlight brand logos or special products and services, which can be printed and fashioned in-house by your SpeedPro partner. LED front and backlighting also make favorite additions to trade show booths. Portable exhibits can come outfitted for spotlighting, including floodlights, display lights, exhibition strips and colored bulb accents. 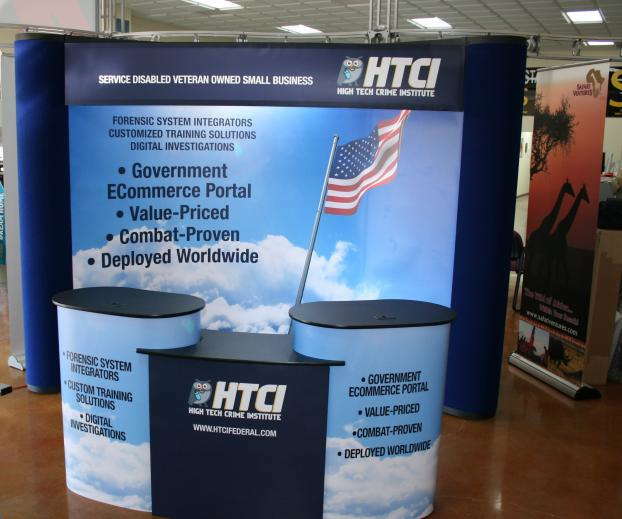 Flatter both the function and form of your corporate trade show booth using digital booth elements. Screens and digital signs can help your exhibit stand out from the crowd, while tablets can relay information about your company’s products or services, display videos, feature multimedia content or turn interactive. For example, have booth attendees take a special, industry or event-relevant quiz on your exhibit’s touch screens. Floor graphics add a final embellishment to your trade show display. Print short-term, “peel and place” custom floor stickers and decals ideal for highlighting your company’s name, logo, brand messaging, company values, wayfinding signage or even creative booth greetings. 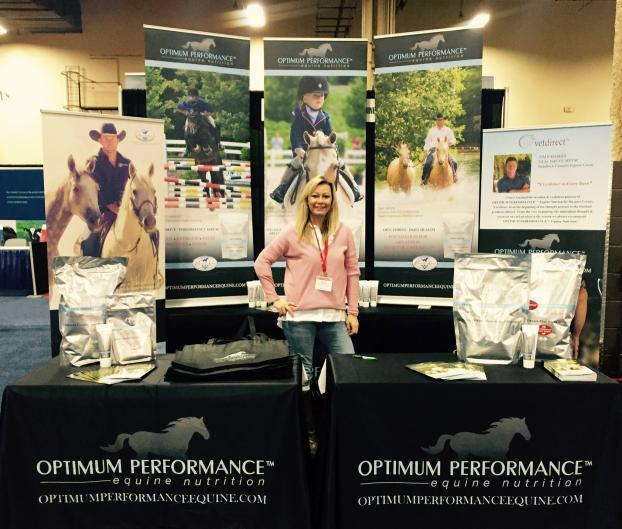 Step-and-repeat banners are a subtle experiential marketing method perfect for the trade show atmosphere. 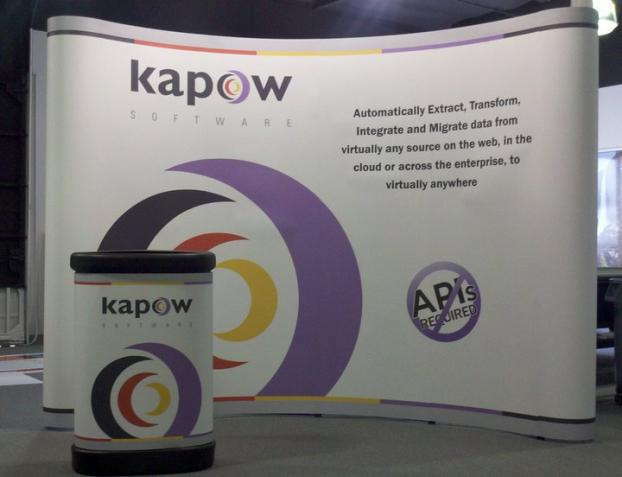 Booth visitors will enjoy snapping group photos or taking selfies in front of your branded backdrop. You can incentivize photo-taking and sharing through product or service giveaways. Or you can create a special hashtag for trade show attendees then share tagged materials on your own social media pages — maintaining a sense of exclusivity while still amplifying your brand. 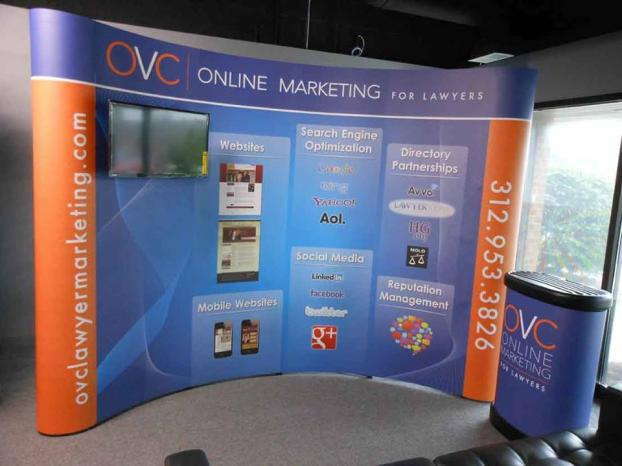 SpeedPro’s nationwide network of visual communications studios can service your company’s pop-up trade show displays — ones that can catch eyes, capture attention, generate qualified sales leads and cultivate a greater industry footprint. Reach out to your local studio and get started today.